Guilderton is a small coastal town north of Perth, Western Australia at the mouth of the Moore River in the Shire of Gingin. Guilderton is a quiet little coastal town at the mouth of the Moore River. It is located about one hours drive north of Perth in West Australia and a very popular spot for a relaxing holiday or weekend getaway. We stopped at Guilderton for lunch during our trip from Jurien Bay to Perth and liked it so much we decided to stay the night at the Guilderton Caravan Park. This park is situated on the Moore River and is conveniently located for various walks around town or along the beach. Guilderton is a pretty spot with some interesting sculptures and decorated amenities (public toilets and picnic tables) located on the river foreshore. There is a cafe beside the caravan park that overlook the estuary and we enjoyed a cuppa sitting on the shaded deck. As you can see from some of the photos it can be very windy with some trees growing with a distinct lean. 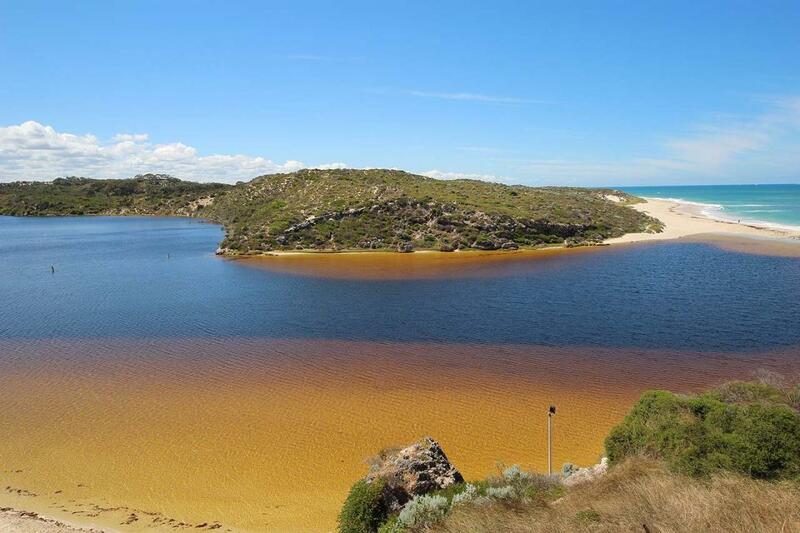 The Moore River Estuary is quite unique as it is closed to the ocean at certain times of the year when reduced water flow allows the waves to create a bar across the mouth of the river (this reopens after heavy rain). This bar turns the estuary into a long freshwater lake allowing vegetation, birds, fish and animals to flourish, while creating a wonderful recreational area. Families area attracted to the sheltered calm water which are suitable for swimmers of all ages. Hire a canoe, paddle boat or try a stand up paddle board (SUP) to explore the fresh water estuary and discover the beautiful surroundings. Fishing is also very popular in the estuary or in the ocean at the river mouth. Surfers enjoy the beach areas just a short walk from the mouth of the Moore River. have you been to Guilderton? Explore Guilderton with RvTrips and find out where to stay, what to do and what to see. Helping caravan, motorhome and camper owners have a great holiday.